Normally finding invoice finance when a large customer trades on "sale or return" terms (SOR) would be impossible. However, we have just completed such a deal for one of our clients. Sale or return means that the customer receives your product and they can return it if they are unable to sell it. If they can sell it they pay for it. Invoices are often raise before the outcome of their sales efforts have been determined, creating an uncertainty over what proporation, if any, of the invoice will be paid. For an invoice finance company this creates a huge risk as the customer could return the product and choose not to pay the outstanding invoicing. Because of this risk, most invoice financiers do not want to fund against SOR invoices. Firstly we searched the market and a number of potential funders declined to finance these SOR invoices. However, one of our contacts was prepared to take a more innovative approach to this customer that had been trading with our client for a number of years. Furthermore, the debtor was a large, well known, company. Many of the funders will disagree with this approach, however they choose to take a more flexible stance in winning this piece of business. The invoice finance company looked back over a number of years at the trading history between the two parties. They were able to quantify the volume of historic returns and this enabled them to set a reduced prepayment percentage, albeit still a substantial percentage of the invoice values. Based on their assessment, they were prepared to fund our client's invoices. It has to be recognised that they stature of the debtor and the established trading patterns were a key factor, however they were the only funder that was prepared to take such an innovative approach. Unfortunately it's not a case of being able to fund all, and any, SOR invoices, however this demonstrates how we can often find business funding solutions in situations where other parties have declined to get involved and provide the cash flow finance that is required for growth. If you have had problems accessing the funding that you need, we have had some success in finding invoice finance companies that are prepared to take a more flexible approach in order to overcome restrictions for our clients. 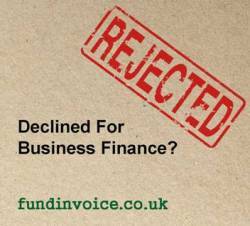 Speak to Sean on 03330 113622 if you have been declined for invoice finance, or given restrictive funding terms.